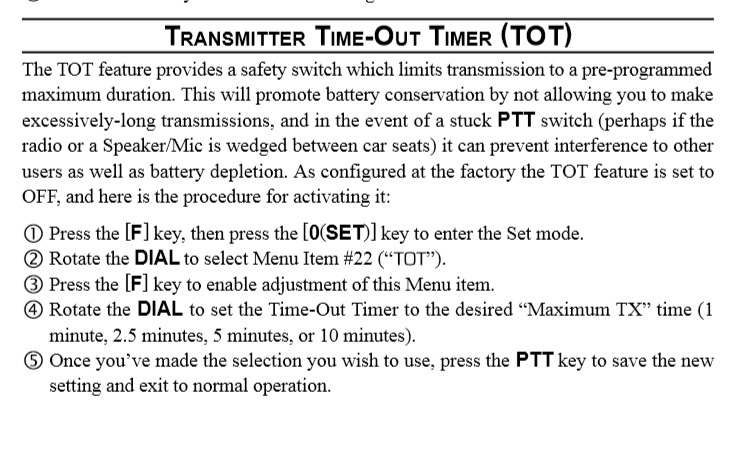 If you fly with a PTT, please set your transmit timer. If you can't do it i'll do it for you. Takes about 20 seconds. Inability to communicate due to a stuck button could be considered a safety issue. OP mentioned this yesterday on the way up the mountain. Seems like this is one of the best suggestions I've heard regarding radios in a long time. I'd agree that having this condition happen can be a hazard to all other pilots if we needed to communicate important information. We'll get something up on the bulletin board for those that don't regularly come to the forum. A great idea. I will do it. Great idea, I'll do it too. The deed is done and tested. It works. However OP failed to mention one thing before you start. You must UNLOCK your radio before beginning. For my FT-150 radio, push the F key and then the LOCK(6) to enable changes. This will save many of us a some grief since just about everyone runs into shorted wires or other stupid reasons where the transmit button gets continuously activated. 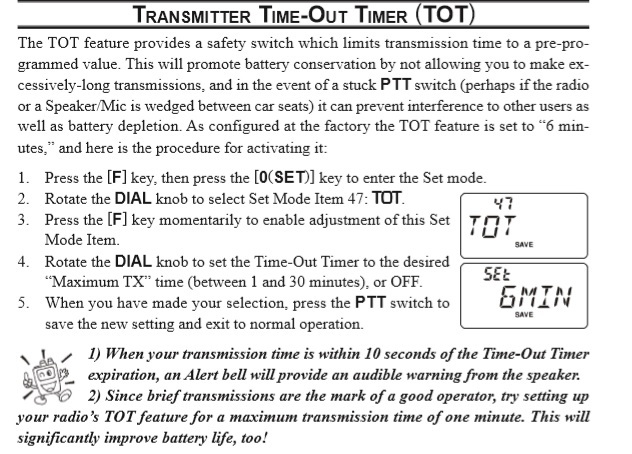 Auto Power Off (APO): If you forget to turn the radio off, it will shut itself down in a determined amount of time. If you have the 170/270; Try the 'RF squelch' in place of the default 'tone squelch.' This makes the difference to upgrade to the 170/270 version.